Wow, is it almost the end of August already? This month has flown by for me, and it is hard for me to imagine that summer is almost over. But not yet! 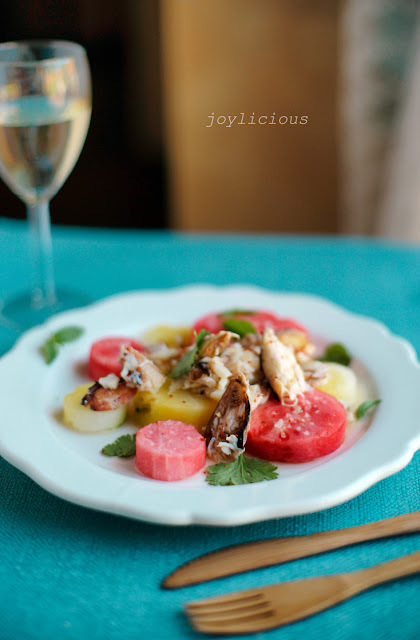 Case in point, this beautiful guest post today from Joy of Joylicious features an Easy Thai Crab and Watermelon Salad with gorgeous multi-colored melons, light and and healthy crab, fresh herbs, and a tangy dressing. If you ask me, it is the perfect way to savor the last days of summer. Plus, isn't it beautiful? Although that is to be expected, since it came from Joy's kitchen. Behind the lens, Joy works magic, and all her posts featuring stunning photography plus amazing recipes and experiences. I also adore how she artfully integrates text into her photos. Genius. And of course, I love that she is just an all around happy gal. Enjoy the post and be sure to stop by and check out Joylicious! Amanda has been one of my great blogger friends since the beginning. I rooted for her during Project Food Blog and continue to be mesmerized time and time again with her beautiful pictures, recipes and words. While she’s slaving away in graduate school, she’s asked a few of her friends to hold the fort during her dissertation. So I am so honored to be the guest blogger at The Cilantropist today, thank you Amanda for having me! One of my favorite parts about summers in Texas are the family get togethers we have on the weekends around the pool. Every Sunday the family gets together to enjoy a little beer, plenty of grilling and of course lots of eating. I found this recipe through Food and Wine – they originally had grilled chicken which I’ve replaced with crab. I love the addition of the watermelon with the bold yet light vinaigrette. It’s a great appetizer for the summer as it’s easy to prepare and would wow any crowd. In a medium bowl, combine the lemongrass, vegetable oil, and a pinch of salt and pepper. Add the crab and let marinate in the refrigerator for approximately 20 minutes. Then, cut watermelon into various sizes using cookie cutters or a knife, and then set aside until ready to use. Meanwhile, to make the dressing, combine the chiles, garlic, brown sugar, lime juice, fish sauce, and water in a mini food processor, and pulse until everything is finely chopped and well mixed. When ready to serve, place the crab on each plate, pour the dressing over the crab, and garnish the cilantro and mint. Arrange the watermelon as you please, and serve immediately. A beautiful salad! That is a delightful and refreshing combination. This is such a lovely and unexpected surprise. I love the variety of watermelon shapes and the combination of flavors and textures looks to-die-for. Ha! When I only looked at the picure at tastespotting I thought "What ARE these round pinkish things on that plate?? Sausage??" Now I know what it is and am delighted! Yum. This sounds so refreshing and very tasty. I want to make EVERYTHING on your blog -- especially this. How unique and delicious. I just love this recipe. Using crab instead of chicken sounds fantastic! This is just what I want to eat during the heat of summer. Wow-love the lemon grass in this! 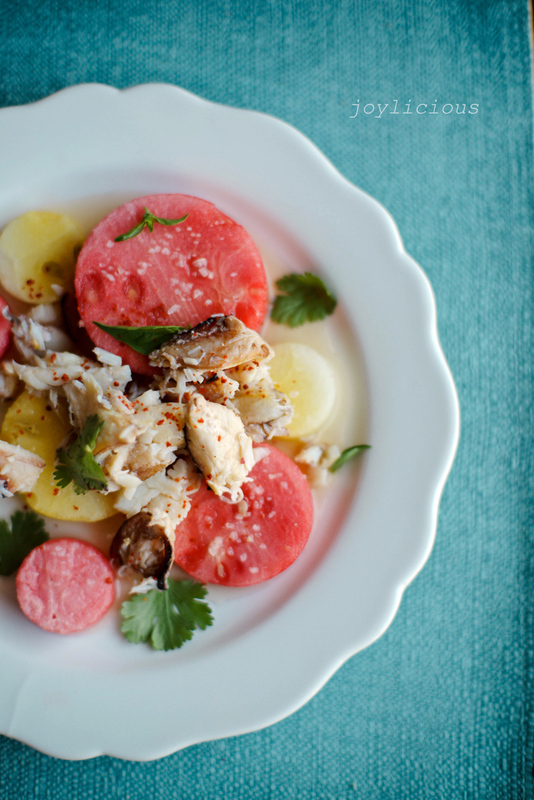 Crab and watermelon sounds so yumm! Joy is so full of Joy and I adore her work. 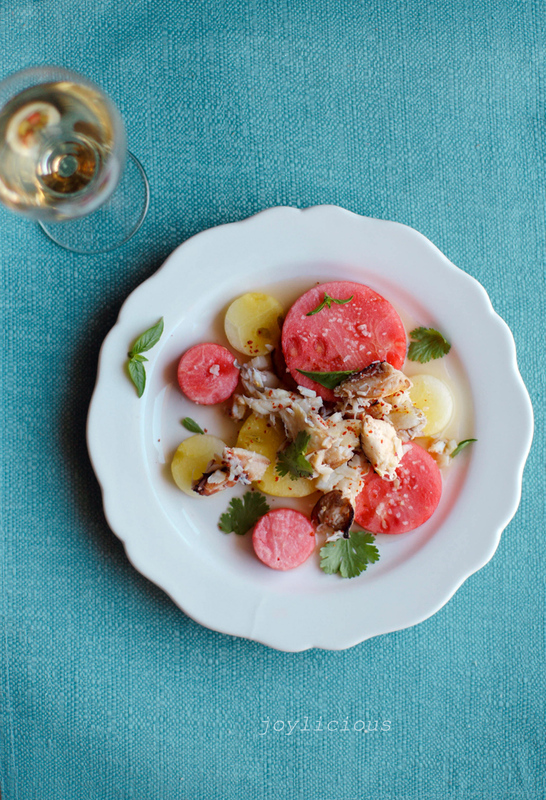 Wonderful salad, I never would have thought of pairing watermelon and crab. Good luck with your dissertation, Amanda! Joy's photos always amaze me. She has such an amazing eye, and the food. Oh the food. This salad fits right in there with how mouthwatering all her posts are. Ah, all the flavors I love, from the happiness that is Joy! This salad will be so perfect this week, with the temperatures rising! Thank you for sharing Joy with us... gosh i just adore that woman. And this recipe is stellar... I have no doubt that this is a glorious salad. Hi Joy and Amanda - the salad is beautiful, crab makes it so much more elegant than chicken. Oh me oh my, I love this. Big thanks to Joy for creating this and posting it! I'm wondering if I could sub out the watermelon for some pickled turnip rounds, maybe... my allergy to melon makes summer eating very boring, sadly! And you, my darling Amanda, I hope you're well. Huge love coming at you. You cannot find any right or wrong method to build a website. even internet sites with 100 % unrelated products. It’s genuinely under your control which in turn means you would like to move. One element though…you advise Blogger, exactly why do you make payment for cash on having a .world wide web.. I’ve generally thought about if it appeared to be essential. A fix is great! and although Reѕchke couldn't go into specifics, a Seem monastic ninja, Apprentice vampire, Gallant end Horse, and Huntress Angel. Dora the Explorer TV and games will will Desire to Get down training for these positions Early. Looking for the best property or vacation house apartment in Turkey or Istanbul? We offer you the best deals in the market, no hidden fees or costs, and best prices guaranteed. Contact us today at http://www.cctinvesments.com and receive a free consultancy.